The Karma, which will have a base price of $87,900 in the United States, features 403 hp and reaches 62 mph in 5.9 seconds with a top speed of 124 mph. The destination charge for the vehicle has not been announced. The Karma goes 0-60 mpg in 5.9 seconds with a maximum speed of 125 mph. Earlier versions of this story slightly misstated these figures. Fisker Automotive, the California electric-car manufacturer, plans to debut its first factory-built plug-in hybrid Karma at the upcoming Paris auto show. The Karma features 22-inch wheels; a low, coupelike profile; and a wide stance. Fisker CEO Henrik Fisker designed the Karma -- which is representative of his stylishly designed cars, such as the Aston Martin V8 Vantage and DB9 and the BMW Z8. “We had a chance to change the premium-vehicle segment with a new kind of vehicle and a new brand that appeals to consumers who are passionate about the environment and who wish to drive a beautiful car that reflects their desire to lead a lifestyle of responsible luxury,” Fisker, the company's co-founder, said in a statement today. The Karma, which has a targeted base price of $87,900 in the United States, features 403 hp and reaches 60 mph in 5.9 seconds with a top speed of 125 mph. The official price and destination charge for the vehicle is expected to be announced during the first quarter of 2011. The Karma has an annual average fuel economy of 100 mpg. It gets up to 50 miles on a single charge before engaging the gasoline engine. Buyers may be eligible for a $7,500 federal tax credit, plus applicable state incentives for electric vehicles. In January, Fisker announced that it signed an agreement with lithium ion battery maker A123 Systems Inc. as its supplier. Fisker has outsourced initial production of the Karma to Valmet Automotive in Finland, which currently builds the Porsche Boxster and Cayman sports cars for Porsche AG. Spokesman Russell Datz said the company has plans for initial production of 15,000 Karmas per year for global distribution. Regular production is set to begin in the first quarter of 2011. In July, Fisker purchased a former General Motors Co. plant in Delaware, where it plans to produce a smaller, lower-cost plug-in sedan, the Nina, in 2012. The U.S. Department of Energy provided Fisker a $529 million loan toward domestic production of the Nina. A123 Systems is also set to invest $23 million in the company -- $13 million in cash and $10 million in A123 common stock. 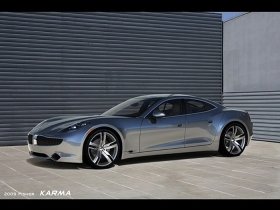 Fisker Automotive began developing the Karma just months after the company was founded in 2007.